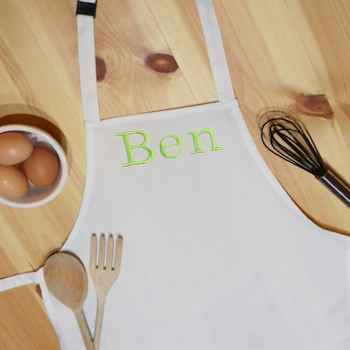 Personalised childs white chefs apron. Personalised childs white chefs apron. Fun and useful gift idea for girls and boys. Enter the name you want personalised and choose the thread colour. Personalised childs white chefs apron. Fun and useful gift idea for girls and boys. Enter the name you want personalised and choose the thread colour. Optional to add an embroidery motif to the apron. Click on the green Add Design link to double click to choose a motif. We will coordinate the embroidery design you select to match the text thread colour. Kids chef aprons are 65% polyester and 35% cotton that is natural white in colour.